Indeed, Mies van der Rohe is one of the most important architectural figures of the past century, and his philosophy, work and impact on modern design have been well-documented in countless books and websites. For more details on the man famous for 'less is more', visit the Mies van der Rohe Society or for those who prefer information presented in a more visual format, take a virtual building tour on YouTube or check out this infographic on his life and work shared by ArchDaily. 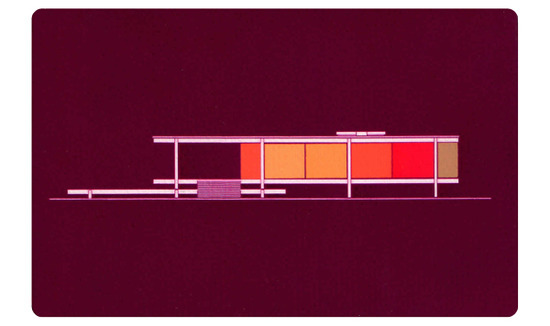 So... instead of reviewing some of those details here, I thought I’d share something a little more personal to commemorate the architect's birthday- my very favorite representation of one Mies’ best known works and historic landmark, the Edith Farnsworth House. This is actually a scan of a card a good friend of mine sent to me years ago- it’s been framed and had its place in every home and office since. I'd like to give credit to the designer who created this lovely minimalist graphic, so if it looks familiar, please comment below or contact me; I’d love to hear more about it!